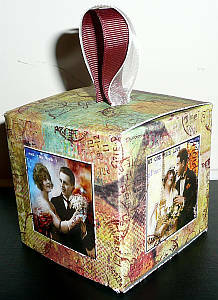 Here is another view of the gift box Chriss made from a face cream box. I think it is so beautiful. She even decorated the inside! 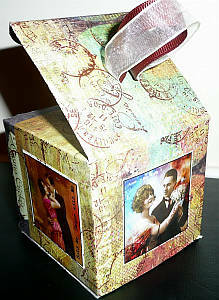 You can customise your own gift boxes by choosing all the papers and embellishments to suit your own occasions. 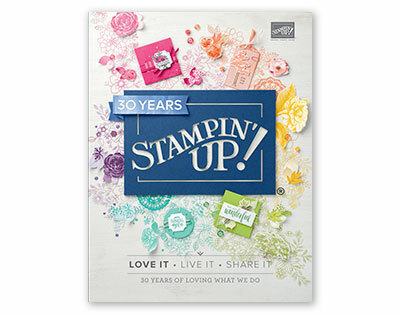 Many commercial boxes are sturdy and they become even sturdier when you reinforce them by decorating them. 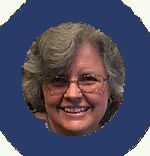 Then they become items that are treasured by their recipients and people tend to keep them and display them. Now you really have me anticipating, Chriss. I think the photo got lost in the Pacific Ocean on the way here to Australia? Lol! I'd love to see a picture if you could send it my way again! From Chriss: LOL hope they are not too wet swimming all the way to you. From Susan: Lol Chriss! Thank you for sending me some pictures of your gorgeous, gorgeous box. They arrived quite dry and crisp, actually! Just look at those romantic images! Sigh! And I love your two tone ribbon pull too! 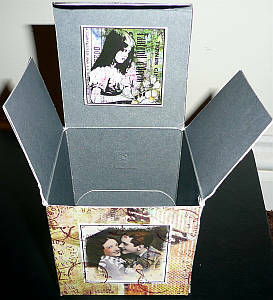 Here is the reverse view of Chriss' lovely altered art piece. It truly is a lovely box, isn't it? Thank you again for sharing, Chriss. I think the right term fro what you have done could also be called upcycling, don't you?